The two vehicles were headed in opposite directions and collided near Carroll’s Way. 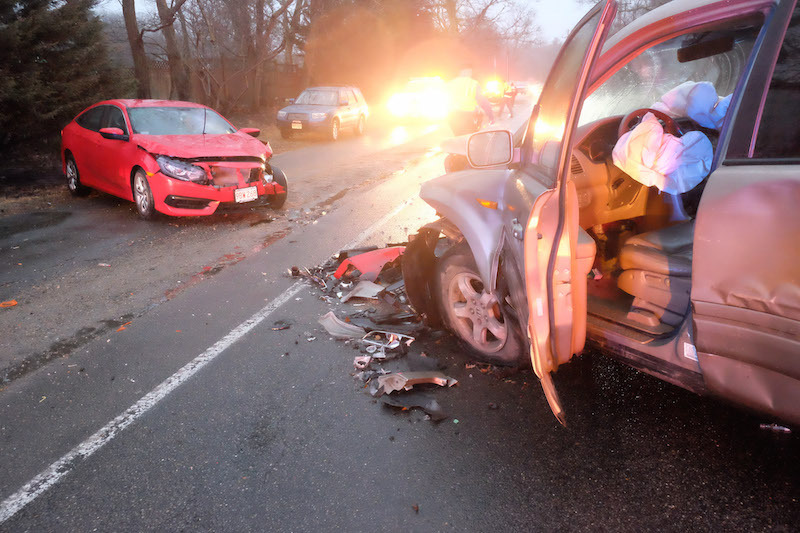 A 22-year-old Chilmark man is facing criminal charges following a two-car collision in Vineyard Haven Thursday afternoon that sent four people to the hospital, one with serious injuries. Alistar Morgan has been charged with operating under the influence of alcohol, operating under the influence of drugs, both with bodily harm, negligent operation, unsafe lane changing and open container violation (alcohol and marijuana), Tisbury police said. Police chief Mark Saloio said police were dispatched to the scene on Edgartown Road near Carroll’s Way at 4:34 p.m. He said initial investigation found that a Honda SUV passed a vehicle on the northbound lane in a posted 45-mile-per hour dotted yellow passing zone. The driver was unable to overtake the vehicle it was passing and collided with an oncoming Honda sedan, the police report said. The point of impact appeared to be the front left driver’s side of both vehicles, it also said. Police said the passing Honda was being driven by Mr. Morgan with two other male occupants, also over 18. All three sustained minor injuries and were transported to the Martha’s Vineyard Hospital where they were treated and released. Only the driver was wearing a seatbelt, police said. Mr. Morgan was arrested and charged after he was released from the hospital. The female driver of the other Honda, a juvenile, was seriously injured and transported to the hospital where she was admitted. Chief Saloio said her condition was stable on Thursday evening. The accident remains under investigation, Chief Saloio said. Tisbury fire chief John Schilling was a first responder at the scene. The Edgartown-Vineyard Haven Road was closed for a short time after the accident. Also responding were two Oak Bluffs ambulances, one Tisbury ambulance, Tisbury fire and police, Oak Bluffs police and state police, Chief Schilling said.